Hope you all had a nice weekend! Mine was full of rest as I'm getting over a cold and fever that came on really suddenly and is taking its time going away. I hope to get back in the mood for cooking this week because I have some new recipes in mind that I want to try out! In the meantime, I thought I would share this hearty Thai yellow curry that I made last week before I got sick. I love Thai food, and I've already experimented with my own versions of Thai red curry and green curry, so I wanted to try something new. 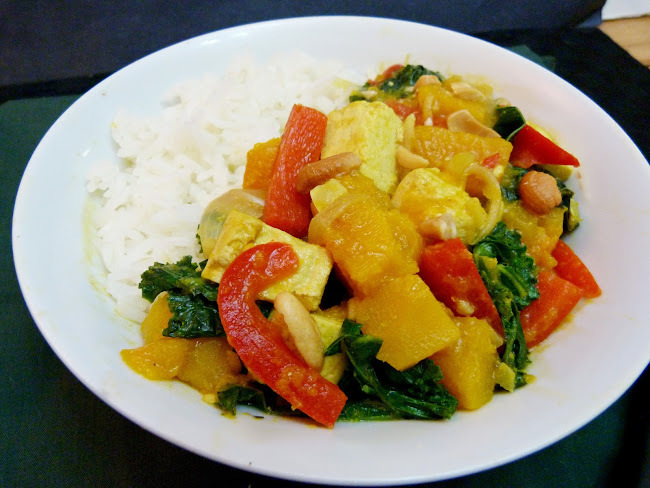 I actually started with the idea of making a panang curry, which I've only ever tried in Thailand and loved it. Unfortunately, I could only find a giant tub of panang curry paste, which wouldn't have been very practical for me, so instead I picked up some yellow curry paste as a substitute! 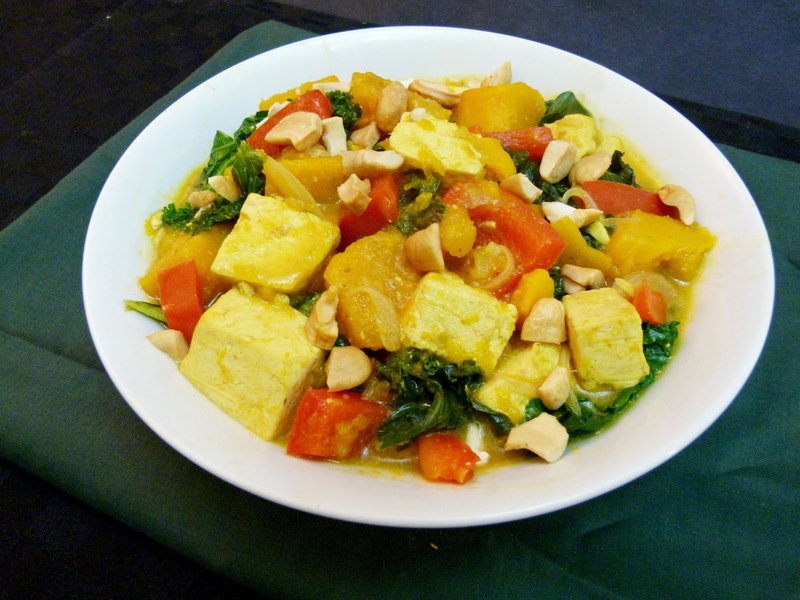 Yellow curry typically has a mix of vegetables simmered in a creamy coconut based broth and tends to be less spicy than other Thai curries. For my version, I used squash, kale and red peppers as the vegetables, and added some tofu for extra protein and substance. Any type of squash should work here - I wanted to use delicata but went with buttercup squash instead, since I couldn't find any delicata at the grocery store. Instead of using canned coconut milk, which I sometimes find too rich, I used coconut milk beverage from a carton. 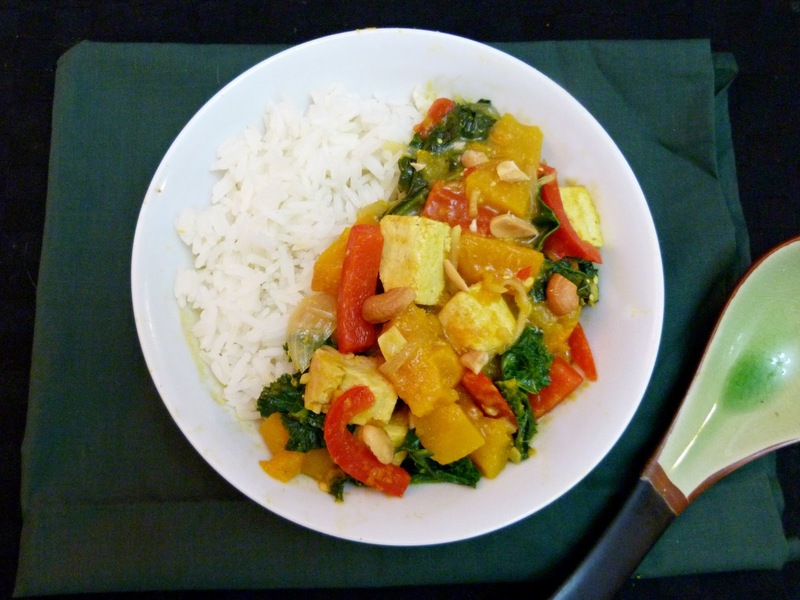 I thought it worked well in the dish, although it made for a slightly less creamy curry, so feel free to use canned coconut milk for a thicker, richer dish! Most of the flavour in this dish comes from the yellow curry paste, which contains ingredients like lemongrass, kaffir lime, turmeric, and lots of other spices. I also added fresh ginger, garlic, shallots, chilies, kaffir lime leaves, and tamarind paste to add deeper layers of Thai flavour and create a fragrant broth. The broth smelled amazing as it was cooking on the stove, and the vegetables turned out perfectly - the squash was nice and tender and practically melted into the curry. The tofu was soft and chewy and it absorbed lots of flavour by cooking it in the spice paste before adding the other ingredients. Overall, I thought this was a nice mellow version of Thai food - it wasn't very spicy but still packed a nice amount of heat. Sprinkle with chopped cashews to add some crunch and serve over rice for a nourishing vegan dinner that should warm you up on these cold nights we've been having lately! Slice block of tofu in half and press between layers of paper towels, under a heavy book. Let sit for at least 30 minutes, then cut into cubes. Heat vegetable oil in a large pot over medium heat. Add the shallots, ginger, garlic and curry paste. Cook, stirring, for about 2 minutes. Add the tofu pieces and stir to coat in the curry mixture. Cook for about 2 minutes. Add 1/3 cup coconut milk and cook, stirring often, for about 4 minutes. Stir in the remaining 2 cups coconut milk, vegetable stock, lime leaves, and red chili. Add the squash pieces (you may have to remove some of the tofu to make room for the squash, so that the squash is immersed in the liquid, then return the tofu to the pot on the top). Bring to a boil, then reduce heat to medium-low, cover, and simmer for 10-15 minutes, until the squash is near tender. Add the red pepper and cook, covered, for another 5 minutes. Stir in the tamarind, tamari, lime juice, sugar and salt. Add the kale leaves and cover for about 2 minutes, stirring once or twice, until the kale is wilted. Serve over rice. Top each serving with a handful of chopped cashews. I love all Thai curries, but yellow is definitely my favorite! I think it's just the right amount of heat for me. This totally looks like you ordered it at a restaurant! I'm glad to hear you've had lots of rest.. then we can enjoy more of your recipes:) This one looks great!